You'll be sure to enjoy the rich texture, and slighty salty taste of our Bay Oysters. Oysters can be eaten raw on the half shell, steamed, baked, grilled, broiled, fried, sautéed, stewed, bisque, oyster Rockefeller, frittered, or as fantastic oyster puffs. Our Bay Oysters are only offered live in the shell. Be sure to add a Oyster Knife and some Jo Oyster Breader to your order. Are premium oysters are great for a fantastic seafood dinner, Oyster bars, restaurants, or your next Oyster party! Oysters are not only delicious, but they're also one of the most nutritionally well balanced of foods, containing protein, carbohydrates and lipids. The National Heart and Lung Institute suggest oysters as an ideal food for inclusion in low-cholesterol diets. Oysters are an excellent source of vitamins A, B1(thiamin), B2 (riboflavin), B3 (niacin), C ( ascorbic acid) and D (calciferol). Four or five medium size oysters supply the recommended daily allowance of iron, copper, iodine, magnesium, calcium, zinc, manganese and phosphorus. The oyster we sell are packaged in a sryrofome cooler with gel packs frozen at sub-zero temperatures. This means your Bay Oysters will be well refrigerated until delivery to insure they are live and fresh. The oyster we sell are packaged in a sryrofome cooler with gel packs frozen at sub-zero temperatures. This means your Bay Oysters will be well refrigerated until delivery to insure they are live and fresh. 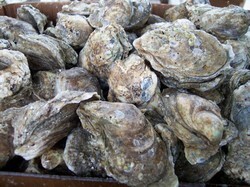 Be sure to refrigerate or prepare your oysters to eat upon receiving your order. You may wish to scrub your oysters with a hard brush before preparing. This method of Shucking Oysters is often used by restaurants for raw oysters on the half shell. First of all be carefull not cut yourself, take your time, and follow instruction carefully. 1. Hold oyster in the palm of your hand cup side down, flat side up, with the hinge or narrow end in your hand. Make sure your holding the oyster in a towel so that you don't accidentally cut yourself! 3. Insert a oyster knife between the oysters shell opening about 1/3 back from the wide end of the oyster. 4. Twist the knife carefully in the crack of the shell and pry the oyster shell open. 5. Go inside the oysters shell and cut around the bottem of the shell to cut the muscle free. 6. Remove the top shell and scrape the meat from the top shell into the bottom shell. 7. If successful you should be ready to serve it on the half shell! First start with a steaming or boiling pot with rack to keep Oysters above the boiling water. Add one part water, one part vinegar, or beer so your mixture is just below the boiling rack. Then layer your Oysters inside the pot adding seasoning or spices if desired for more flavor. Cover and steam live oysters in the shell for 4 to 9 minutes after the shell opens. Enjoy! Place your oysters cup side down on a cookie sheet to catch the liquid. Bake at 450 degrees for 15-30 minutes, depending on the size. Some shells will not be opened, so some prying will be necessary. Be careful if hot! Oysters cooked cup side down will hold the liquid, making a jucier meat. All of our Bay Oysters are only sold as they run and not by size. Store at 40 degrees F in dry refrigeration. Oysters can stay fresh and alive for up to two weeks after they are harvested. The oysters were excellent, and so was the delivery. They were packed great and I'm very pleased with the taste of the fresh oysters. I'll be dealing with again in the near future. I have ordered the bay oysters for two years and have been very pleased. Shipping is timely and the oysters come fresh and are delicious. First time customer and I'm VERY please with your S/H, customer service and MOSTLY the QUALITY, will order again. Thanks.